"This is so good…! You wrote this?" "Yeah, with my dad." Gunpowder & Sky has released the first official trailer for the heartwarming, lovely indie film Hearts Beat Loud, which premiered to some rave reviews at the Sundance Film Festival earlier this year. I adore this film, it was one of my favorites of the fest - check out my full review here. Set in Red Hook, Brooklyn, the film is about a father and daughter who become an unlikely songwriting duo in the last summer before she leaves for college. Nick Offerman and Kiersey Clemons star, along with Ted Danson, Toni Collette, Sasha Lane, and Blythe Danner. With original songs and music by Keegan DeWitt, which you can hear a bit of in this trailer. Really, this film is stellar and I hope it gets your attention with this trailer. It is a feel good story, but just the right amount of sweet. As single dad Frank (Nick Offerman) prepares to send hardworking daughter Sam (Kiersey Clemons) off to UCLA pre-med, he also reluctantly realizes he has to accept that his own record-store business is failing. Hoping to stay connected with his daughter through their shared love of music, he urges her to turn their weekly "jam sesh" into an actual band. Channeling Sam's resistance into a band name, they unexpectedly find We’re Not a Band’s first song turning into a minor Spotify hit, and they use their songwriting efforts to work through their feelings about the life changes each of them faces. Hearts Beat Loud is directed by American filmmaker Brett Haley, of The New Year, I'll See You in My Dreams, and The Hero previously. The screenplay is written by Brett Haley and Marc Basch. This first premiered at the Sundance Film Festival earlier this year (read our review). 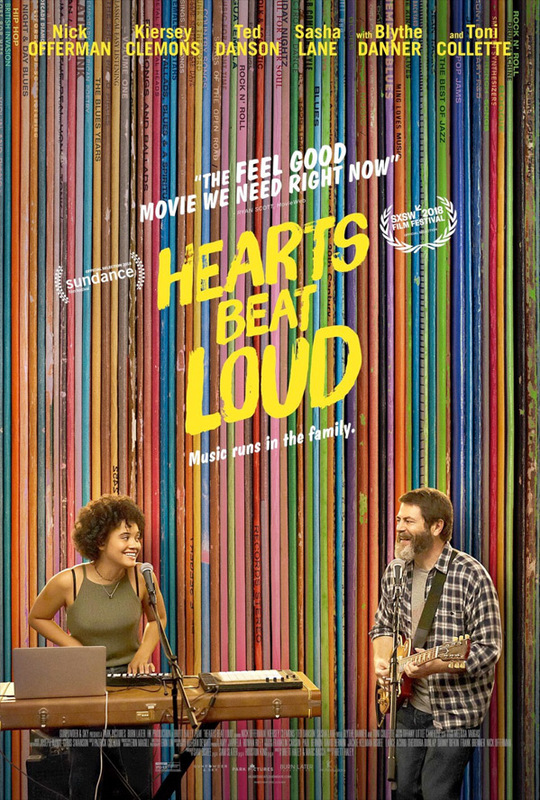 G&S will release Hearts Beat Loud in select theaters starting June 8th.